When it comes to fraternity chapter budgeting, you’ve seen it all. The good. The bad. That year the chapter went without a fall social. You don’t like to talk about that year. You can tell brothers, however, whether they’ve got the budget on track. And if they don’t? You can help fix it. You won’t be able to stand in the way of a speeding deficit train for a chapter treasurer, or catch a bullet of unpaid dues between your teeth. The fraternity treasurer will have to handle those challenges himself. Yet, you certainly know a thing or two about fraternity financial management, and you can offer guidance in invaluable ways. Maybe you served as chapter treasurer when you were an undergraduate brother. Maybe you’re the Alumni Association’s current treasurer. You might own or manage a business, work in finance or have other experiences and training that’ve made you wiser. Fraternity treasurers are always seeking such wisdom. Now’s their chance to get their hands on some. It’s getting to be that time of year when a good Charles Dickens book can fill us with winter joy. However, fraternity men already have their own Tale of Two Treasurers to tell. OmegaFi wants to help you unravel this yarn. Let’s talk about What an Alumnus can Teach an Undergraduate Brother when it comes to chapter finances. The fraternity treasurer mans a uniquely rewarding yet challenging chapter post. When the budget’s perfectly balanced and everything’s in the green thanks to his hard work, he’s on cloud nine. When brothers constantly “lose their wallet” and aren’t paying their fraternity dues, and when the treasurer’s shoveling costs overboard to keep from sinking into a deficit, the frustration can make him want to just give up. Thankfully, he happens to be part of a brotherhood, and in brotherhoods, someone’s always watching your back. Sometimes brothers can feel like managing chapter finances takes a superhuman effort. Actually yes, those things are birds and planes. Look down, bro. Your alumni are standing right in front of you, and they can help. If you’re an alumnus who served as chapter treasurer back in the day, congratulations. You’re the magical rainbow unicorn of chapter financial management know-how. Sometimes, though, you have to let brothers know you’re not really a unicorn. You speak human. Invite the chapter treasurer out to a nice lunch and let him pick your brain. After all, you hold the advantage of having seen how budgeting trends affect a chapter not only during the semester or two you served as treasurer, but over the years before you graduated. This may have been a while ago, so don’t feel bad if you can’t recall specific numbers. Like past chapter treasurers, a current alumni association treasurer has a pretty high level of financial management knowledge. If you volunteer with the housing committee or otherwise handle some aspect of current chapter finances, that’s even better. It means you have a lot of financial responsibility on your shoulders, and you’re in the same boat as the chapter treasurer, since chapter success rides on your decisions. To see this in action, encourage brothers to attend alumni leadership meetings to give them a better idea of how alumni handle finances. 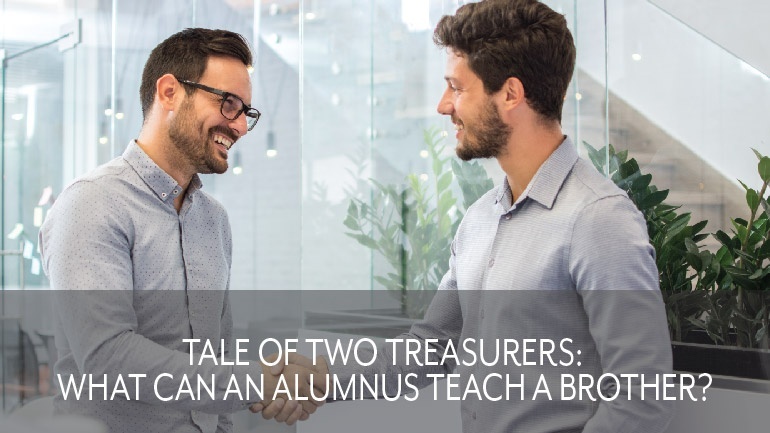 Brothers may ask for number-specific advice, and this might be easier for current alumni treasurers or those who’ve graduated more recently to answer. But what they should really be looking for from alumni are bigger-picture lessons. If you could give one piece of treasurer advice, what would it be? How you got brothers to pay their dues back then. Cattle prod? Maybe don’t mention the cattle prod. However, you should tell stories about your time in the chapter. Oftentimes, your fondest memories of your brothers--even the ones who never paid dues on time--can leave undergrads with lessons just as important as any direct advice you give about the fraternity treasurer gig. Your joy teaches them to be joyful, even when things are tough. Your triumphs teach them that they, too, can triumph. What about Alumni Who Never Served as Treasurer? It’s helpful if, when brothers solicit you for treasurer advice, you have some kind of financial training or a degree in a related field. If you own or manage a business, you understand the consequences of poor budgeting in a complex way. If you work in finance or banking, you’ll have some nuanced advice about managing money for a large group of people. But when it comes down to it, does understanding how derivatives trading works really help anyone become a better treasurer, or a better brother? Most undergraduate treasurers don’t know that kind of stuff and still manage to budget their butts off. They benefit from having a lot of the information laid out for them in the chapter bylaws, as well as the new member transition training they received from the outgoing treasurer. Beyond that, they can follow their instincts and always rely on the guidance of fellow executive officers. Financial expert or no, as an alumnus you still have many important lessons for brothers about what it means to be a fraternity man. If they’re willing to hear you out, your advice will pay innumerable dividends. If you could give your chapter treasurer one piece of advice, what would it be? What other important lessons have you learned on your journey to becoming an alumnus? Share your sage advice in the comments below!